Zinc plated finish is attractive and durable. Full double ball hardened raceways for better performance and greater durability. 5/16" shouldered axle with 1/4" nut. .090" steel top plate. Colson 45" multi-temp grease lubricates in extreme hot and cold temperatures. Zinc plated finish is attractive and durable. Full double ball hardened raceways for better performance and greater durability. 3/8" hollow axle with lock nut. Grease holes on wheel bearing for greater convenience. Colson 45" multi-temp grease lubricates in extreme hot and cold temperatures. Attractive zinc plated finish. Full double ball hardened raceways. 1/2" hollow axle with great zerk and lock nut. 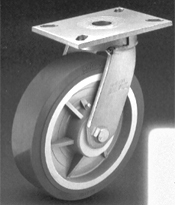 Plastic seal/retainer washer (roller bearing models). 1/4" stell top late for durability. Permanet rivet king pin with 5/8" diameter rivet. 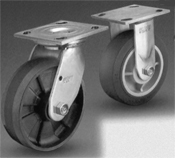 Grease fittings: wheel bearing and swivel raceway. Colson 45" multi-temp grease lubricates in extreme hot and cold temperatures. Attractive zinc plated finish. Full double ball hardened raceways. 1/2" hollow axle with great zerk and lock nut. Plastic seal/retainer washer (roller bearing models). 5/16" steel top late for durability (1/4" rigid top plate). Heat treated bolt and nut king pin with 3/4" diameter bolt. 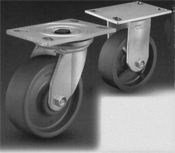 Grease fittings: wheel bearing and swivel raceway. Colson 45" multi-temp grease lubricates in extreme hot and cold temperatures. Attractive zinc plated finish. Full double ball hardened raceway construction. 3/4" solid axle with nut. 3/8" steel top plate. Formed fork legs feature robotic welding inside and out for consistent quality. For legs 3/8" thick x 2-1/2" wide. Recessed zerk great fitting on swivel raceway to prevent damage, great fitting on wheel bearing for easy maintenance. Colson 45" multi-temp grease lubricates in extreme hot and cold temperatures. Zinc plated finish is attractive and durable. Heat treated full double ball hardened raceways. Low profile design offers low load height and quick swivel response. Ideal for business machines, stock picking carts, warehouse dollies and housekeeping carts. Thread guards standard on all models, but are not available with 3" brake option. Polished stainless steel (Grade 304). Full double ball hardened raceways. 1/2" hollow axle with great zerk and lock nut is stainless steel. 1/4" steel top plate for durability. Permanent rivet king pin with 5/8" diameter rivet. 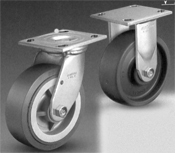 Grease fittings: wheel bearing and swivel raceway. Colson 45" multi-temp grease lubricates in extreme hot and cold temperatures. NSF listed. 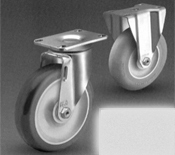 Foot brake easily engaged; mechanically locks both swivel and wheel rotation. Strong pressure diecast metal construction for lasting performance and maximum reliability. 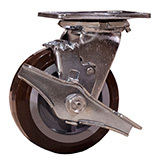 Precision axle built to exacting tolerances for smooth opeartion and extended service life. 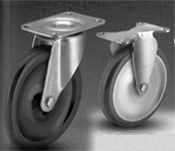 Aluminum die cast body and wheel centers. Standard finish is white or ball burnished and lacquered. © Copyright 2018, Global Caster Corporation. All rights reserved.